Hypothyroidism – Have you been Dismissed? Thyroid disease affects an estimated 40 million Americans.Nearly 90% of them are women. That means 1 in 8 women can expect to develop hypothyroidism in their lifetime. 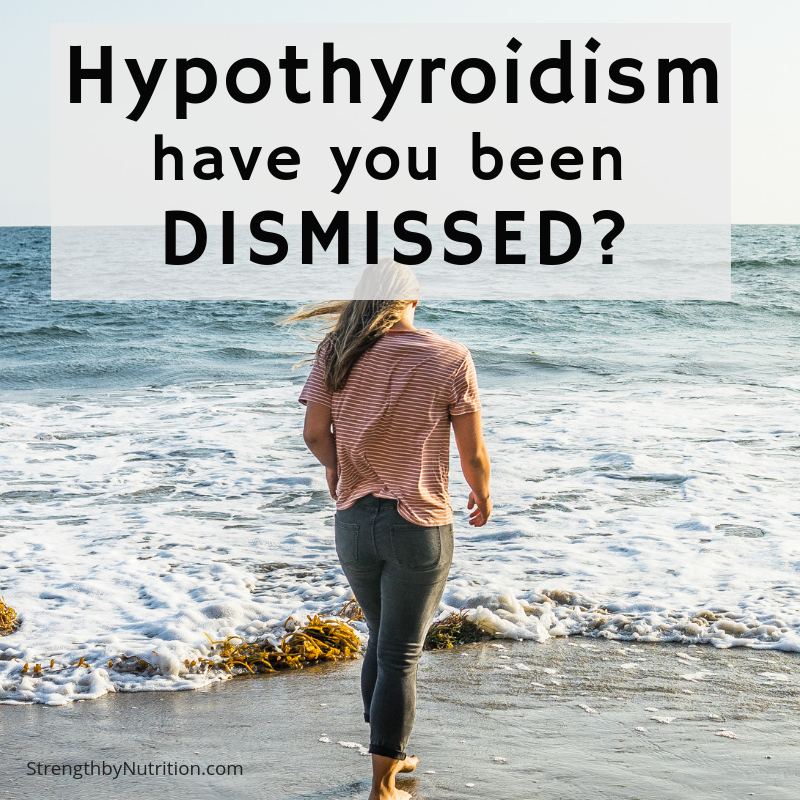 Think you might be affected by hypothyroidism? Perhaps you’ve gained a significant amount of weight over a short period of time. Or felt like your memory and cognitive function are impaired. Maybe you’ve felt especially anxious, depressed, and struggle with sleep issues. Even more, you have heavy periods, lack of periods, fertility problems, or the ability to produce enough breast milk when you had your kids. Perhaps you are having a rough transition into menopause. These are just a few of the hormonal symptoms you can experience with hypothyroidism. You may have heard of Hashimoto’s (the autoimmune disease that causes hypothyroidism). Not only can you struggle with the symptoms of an under-active thyroid, but you might also be at an increased risk of developing more autoimmune diseases. Autoimmunity is one of the top 10 causes of death of women in the US. Something we can’t take lightly. What’s worse, Hashimotos’ is often under-diagnosed and if it is diagnosed, it is likely under-treated. Both lack of treatment and inadequate treatment lead to unnecessary suffering for millions of women. They are told that they’d feel better if they just ‘stopped eating so much and exercised more’ and if they just started ‘taking more control over their lives,’ they could lose the excess weight. Women may be told that their symptoms are anything but biological and that its’ s just ‘STERSS’. And if they just ‘got some rest, mediated, exercised more, etc,’ then they’d feel better. Or even worse, has a doctor told you any one of these things? ‘you have depression, here is a prescription for an SSRI’. ‘you’re fine, we can’t find anything wrong with you’. These are all real quotes given by doctors to their patients. Research shows that medical professionals are more likely to write off women’s symptoms as “psychosomatic’ or ‘emotional’ rather than being physiologically true. Just in the past year of really paying attention to this we’ve gleaned a trend of women not feeling heard, feeling powerless, wrought with shame about their memory issues and weight gain, and going down years’ worth of other medical treatments like anti-depressants, anti-anxiety, and even fertility treatments or having to put their babies on formula when they couldn’t produce enough breast milk. Women have reported that it’s taken up to 5 years to get a proper diagnosis of Hashimoto’s. It’s important to know that the symptoms aren’t just inconvenient, they may also pose serious health risk – it may increase the risk of heart disease and dementia. And in younger women, the quality of life decreases so much that relationships, career, finances, and fertility can all affected. Not to mention being robbed of joy, vitality, and happiness is no fun. Is hypothyroidism a feminist issue? I love Aviva Romm’s take on this concept: “If you think about it – it’s a situation uniquely faced by women and caused by cultural values and stereotypes that negatively affects women. So ya – I’d label it as a feminist issue. It is the dismissal by the medical system of women’s voices, needs, and very real symptoms that make thyroid problems a feminist issue. It’s this type of medical model that women don’t feel comfortable speaking up in their doctor’s office fearing they’d be seen as difficult and hysterical. Why is this particularly relevant with hypothyroidism? Because the current definition of hypothyroidism means that a patient exceeds a TSH reading of 5.0. First of all, this TSH lab is arguably too high, leaving many women feeling symptomatic, but not getting a diagnosis. We call this ‘sub-clinical hypothyroidism.’ (click here to read more about optimal vs. lab ranges). There is also an issue with doctors only testing TSH and ignoring the rest of the thyroid hormone puzzle. In fact, most hypothyroidism is seen at a cellular level – meaning ALL the lab values would appear ‘normal,’ yet you are experiencing all the symptoms. Click here for a complete list of thyroid tests to provide your doctor so they can work with you in getting tests done. And while you’re at it, check out these studies you can hand to your doctor if you feel misunderstood, dismissed, or otherwise ignored. All that being said, there are plenty of integrative doctors out there that specialize in thyroid disease, you just have to know what to look for (click here for tips and tricks on how to find a thyroid doctor). So what do we do about this ladies? Education. We educate ourselves, we trust ourselves, we empower ourselves and we start believing in ourselves. We start taking responsibility over our own health. There is very little research on the root causes of these autoimmune conditions such as Hashimoto’s. But perhaps there is something going on in our personal ecosystem or greater global system that is causing these outrageous increases in the disease? It’s well-established through research done by the World of Toxicology that women are uniquely vulnerable to environmental toxins including herbicides, pesticides, pthalates, plastics, heavy metals, and more. Studies from gastroenterologists found that food triggers, particularly gluten, dairy, and artificial sweeteners can cause Hashimoto’s to worsen. In addition, research into the microbiome has revealed a connection between microbiome diversity and hyper-permeability of the gut lining (or commonly known as leaky gut). So to me, the dots are connected. It’s no secret that we are exposed to a greater amount of environmental toxins than every before, we aren’t receiving the adequate nutrition we need in order to properly detoxify of these compounds, and in addition, our immune systems are overactive and on high alert because of a compromised gut lining. But this information is not making it’s way into the medical school, residencies, or conventional doctor’s offices. Thus it’s not getting to the women who need it. Women struggling with thyroid disease is NOT a small group. There are at least 30 million women in the US alone. And we have to believe we can change the world even if we are struggling with debilitating fatigue. Even more importantly, if we aren’t struggling with this disease, we need to advocate and stand up for our fellow sisters in any way that we can. If anything, we need to be willing to be ‘difficult,’ ‘loud,’ and ‘unruly’ against common, conventional practices – especially those that don’t serve us. We deserve to be treated as the best experts of our own body. Because each of us IS the best expert of our own body. We deserve doctors that are willing to honor that, listen to us, and give us the respect, support, information, and access to the resources we need to live our best life. And we deserve to work WITH doctors in this type of collaborative model, not a dominating one. But until this is the reality, we must continue to be brave, persistent, empowered, and an advocate for our own best health. I stumbled upon this article and after reading it, I agree with most of the points you made. Patients really do need to be their own advocates. Especially with hypothyroidism and other thyroid disorders, most doctors just seem to follow the same procedure of prescription levothyroxine and synthroid and just leaving it at that. This may not work for all patients and some may need to explore other drugs or thyroid supplements to help with their symptoms and help their thyroid health.